Médecins Sans Frontières (MSF) is alarmed by the decision of the Humanitarian Committee of the self-proclaimed Lugansk People’s Republic to refuse permission for MSF to provide critical medical and humanitarian assistance in Lugansk. MSF is extremely concerned that this will deprive vulnerable people in Lugansk of access to essential healthcare and medicines. 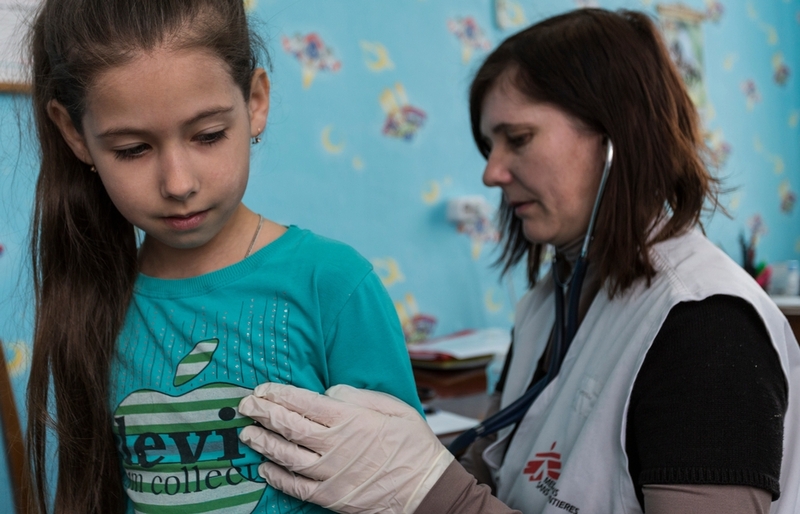 “We find the decision unacceptable given the significant medical and humanitarian needs of people affected by the ongoing conflict in Lugansk,” says Dr Bart Janssens, MSF Director of Operations. 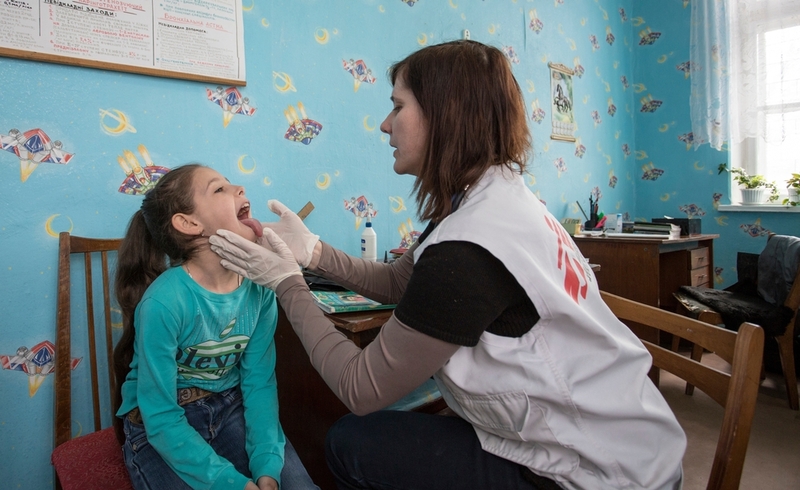 A paediatric examination underway in an MSF mobile clinic, in the town of Zorinsk near Lugansk. Since June 2014, MSF has supported 109 health and social facilities in Lugansk with essential medicines, medical supplies, equipment, hygiene materials and relief items. Through mobile clinics in 35 locations, MSF teams have provided more than 42,000 primary healthcare consultations in conjunction with doctors from the public health service. MSF has donated medicines and medical supplies to treat up to 37,500 people with chronic diseases such as diabetes, hypertension and heart disease, as well as up to 4,900 war-wounded patients during periods of intense fighting. All healthcare and medicines have been given free of charge. 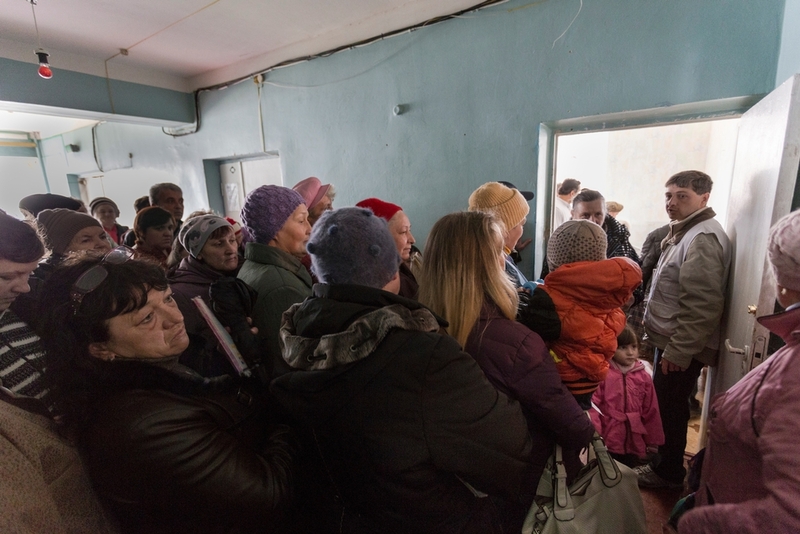 “Due to the conflict, the supply of medicines in Lugansk has been disrupted or cut for the last year and the price of available medicines has increased significantly”, says Janssens. Patients at the MSF mobile clinic in Bolshaya Vergunka, Lugansk, line up to receive their prescribed medicines, May 2015. All MSF’s activities, including the transportation, storage and distribution of medicines to health facilities, have been coordinated with, and regularly reported to the health authorities in Lugansk. Following the decision of the Humanitarian Committee, MSF has closed its office in Lugansk and no longer has any staff present in the area under LPR authority. Before leaving, MSF has donated its remaining stock of medicines for distribution to health facilities that urgently need them. “We have made every effort to be transparent and work in cooperation with the authorities,” says Janssens. MSF is continuing its work on both sides of the frontline throughout the east of the country, including in the area under the authority of the self-proclaimed Donetsk People’s Republic. Since the beginning of the conflict, MSF has supported more than 350 health facilities on both sides of the frontline with donations of medicines and medical equipment. Since May 2014, MSF teams have provided more than 102,000 primary health care consultations, medical supplies for treating more than 23,000 war-wounded patients, and medicines to treat more than 61,000 patients with chronic diseases. MSF has been running a drug resistant tuberculosis programme in Donetsk region since 2011, currently treating 196 patients with the disease in the penitentiary system.